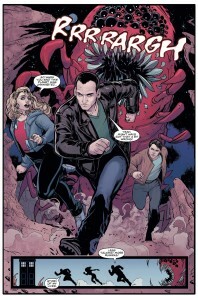 Pullbox Reviews: Doctor Who The Ninth Doctor – Fantastic! 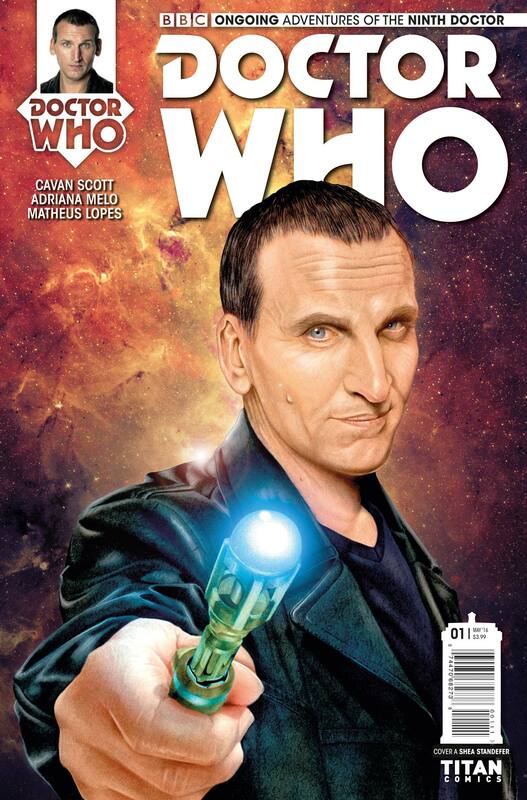 This is the first of an ongoing Ninth Doctor series, portrayed brilliantly on TV by the gorgeous and talented Christopher Eccleston. His companions for this story are the very familiar Rose Tyler (beautiful Billie Piper) and Captain Jack Harkness (equally beautiful John Barrowman). They’ve just started to gel as a TARDIS team, and as they’re scanning for hits on a temporal beacon, they pick up a message from….Captain Jack Harkness. 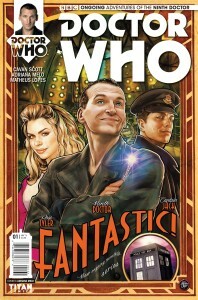 As they go to investigate, they land on a planet that is all ready to welcome the Doctor. Apparently there’s a wonderful television show called “Doctor Who?” starring someone who looks remarkably like our Ninth Doctor. 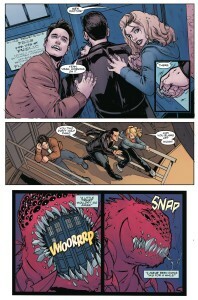 As he is mobbed by fans of the show, Rose sneaks off to investigate and a significant discovery is made. 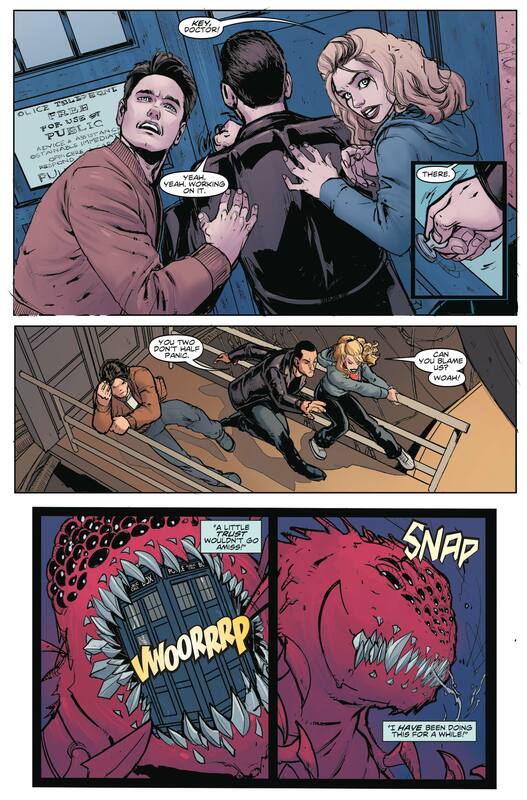 Cavan Scott is obviously knowledgable about the details and mannerisms of the different characters as he has much experience writing Doctor Who tie-ins. He takes what we know about these characters and puts them into situations that you KNOW they’d get into. Doctor Nine’s discomfort with being a celebrity is palpable, and Jack’s amazing ability to flirt with everyone is on full charming display. This is just a really FUN story. 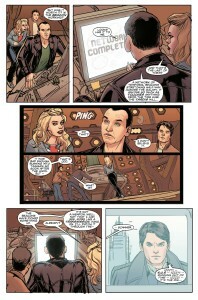 The art by Adriana Melo is masterfully done as well, a fitting compliment to Scott’s story. 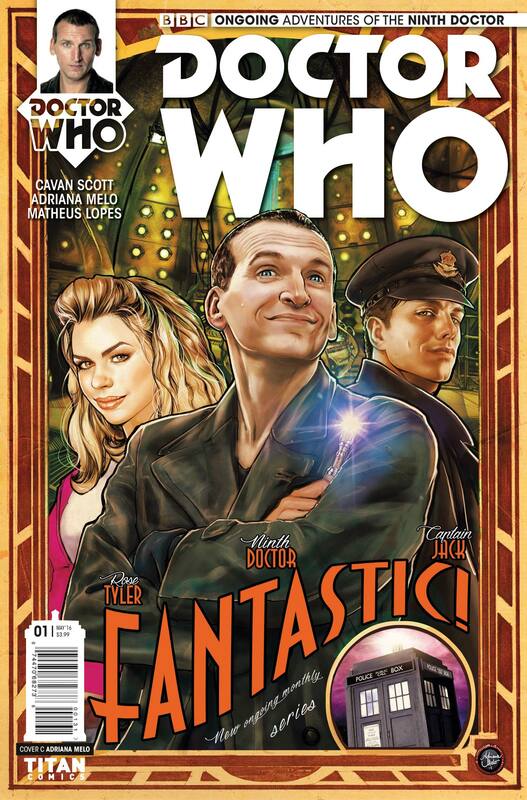 Also acustomed to working on licensed books, her characters look and move and have expressions that the Doctor, Rose and Jack should always have. This is just beautifully done, plus the action is imaginative and the world they land on have interesting, engaging humanoid inhabitants. Lopes’ colors work well, even to getting most of the eyes the right color (although Rose’s are a little on the green end of the hazel scale instead of gold), yet still managing to get our heroes to stand out on the page.